For the last 4 weeks I have endured a program that has at times pushed me to my limits. Not so much from a physical standpoint, though the program is very much physical, but from a mental standpoint. The Chinup Project is as mentally tough as it is physically tough. More so than I could have ever thought. The daily grind of 4 to 5 sets of chinups became to be a nuisance. It seemed at times I was going to the pullup bar as much as I was going to the bathroom! However, even my lack of excitement nearing the end of this 4 weeks was not going to deter me from completing my mission. I fought through it and enjoyed the pump I received after each set nonetheless. So, enough about my mental state during the program. Let’s get to the results after 4 weeks. Here we go. 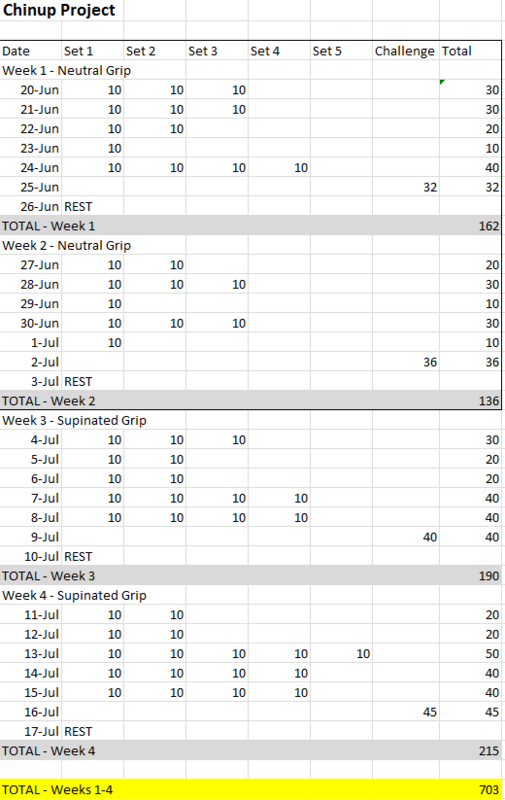 As you can see above, in weeks 3 and 4 I was able to increase my chinups and winded up with over 700 chinups in 4 weeks. The number 700 became my motivation every time I went to complete a set in the last week. I wanted to hit that number if only because I knew it was within reach. So, how much growth in arm size did I receive? See below. Boom! After 4 weeks and 703 chinups, the results are in. 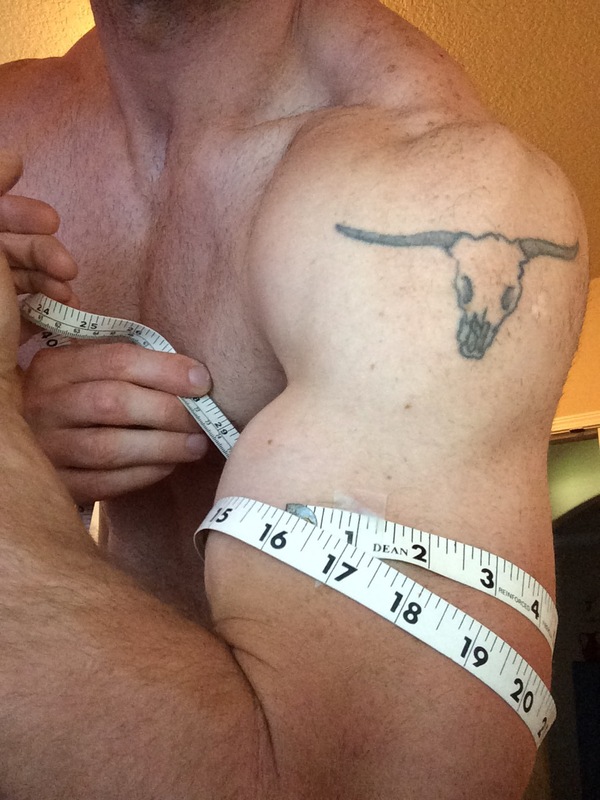 The “Chinup Project” has held true to its word and I’ve added at least a 1/2″ to each arm. Just as good, I feel my arms are bigger too! Shirts are a bit harder to get on and off. 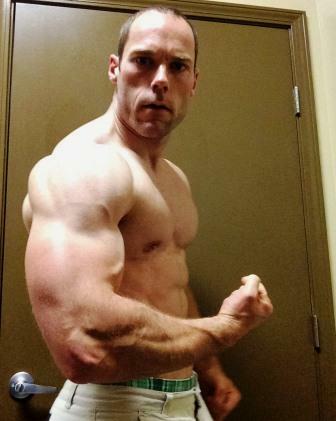 I flex my bicep and I notice a bulge. All is well and any anguish I endured during this time has been worth it. Chinups are a great way to pack on muscle. Having never used them vigourously in the past, they have now become a staple in my programming. This program works. I’d be ticked right now if it didn’t! Supinated grip (palms toward you) is much easier than neutral grip (palms facing each other). At least it feels easier. Greasing the groove takes a strong mental approach. You have to really want it! Moving forward, I believe the program will be a bit easier. At least from a mental standpoint as I won’t be having to complete chinups on the daily. The prescription for the next 4 weeks is weighted chinups, 3 days a week, using your 6 rep max weight (for me, 35 LBS) for 25 reps each day. Alternate between supinated and neutral grip. 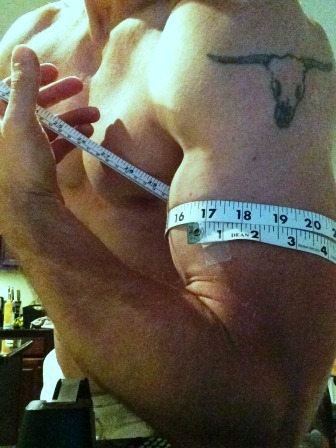 Expect to grow another 1/2″ to your arms! Stay tuned, I’ll be back with an update in 4 weeks. Until then, Stay Jacked, Stay Strong!